My previous flight was a rather pleasant day flight, with the extremely polished Singapore Airlines up from Melbourne arriving into Changi’s Terminal 3. 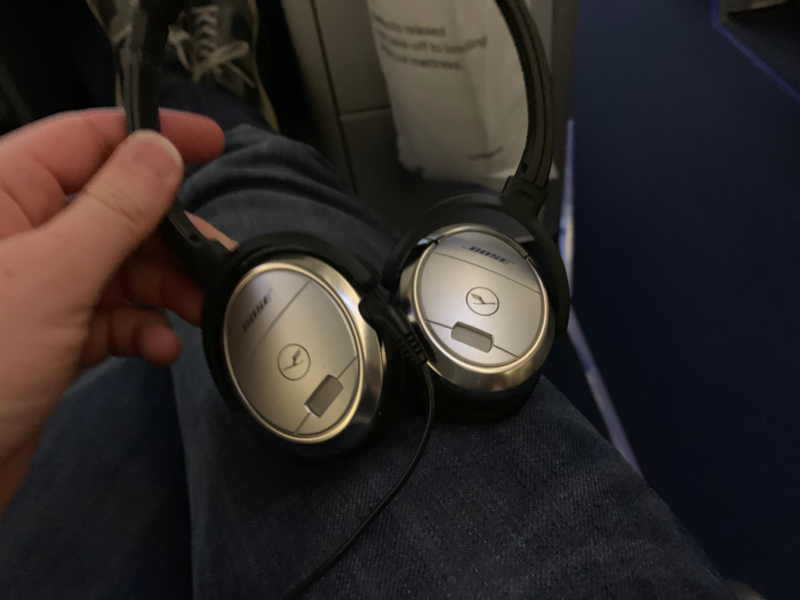 From there, I was connecting to Lufthansa’s A380 service to Frankfurt around three hours later. Singapore’s Changi airport is one of those that I’m quite conflicted about. It’s generally very efficient indeed, however there are some very long walks involved, and the carpets there are a sight to behold. My flight arrived into Terminal 3 and left from Terminal 2. Terminals 1, 2 and 3 are all actually the same U shaped building, so if you have a long transit, and wish to get your steps in, then you can walk between them. 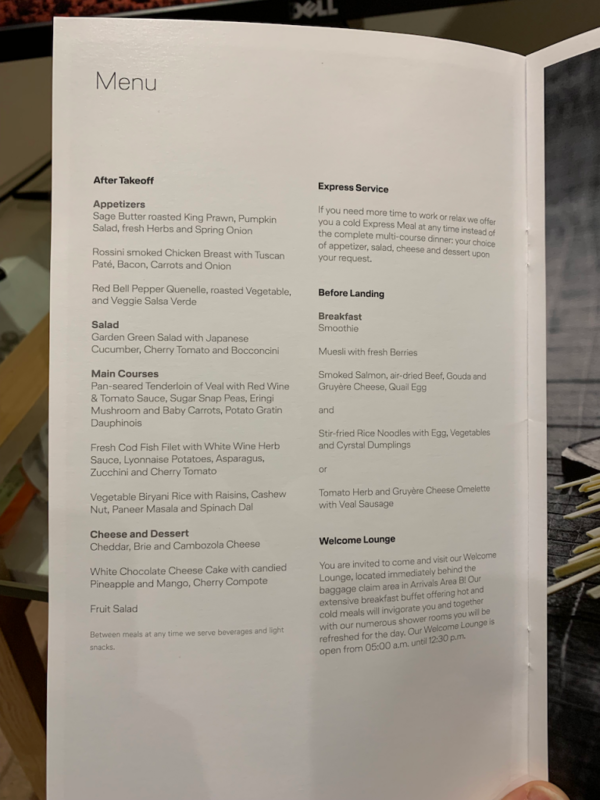 Having a little less time, I took the little monorail train from 3 to 2, and found the Singapore Airlines SilverKris lounge there. I haven’t done a full review, but generally my opinion of the lounges was fairly under-whelming. 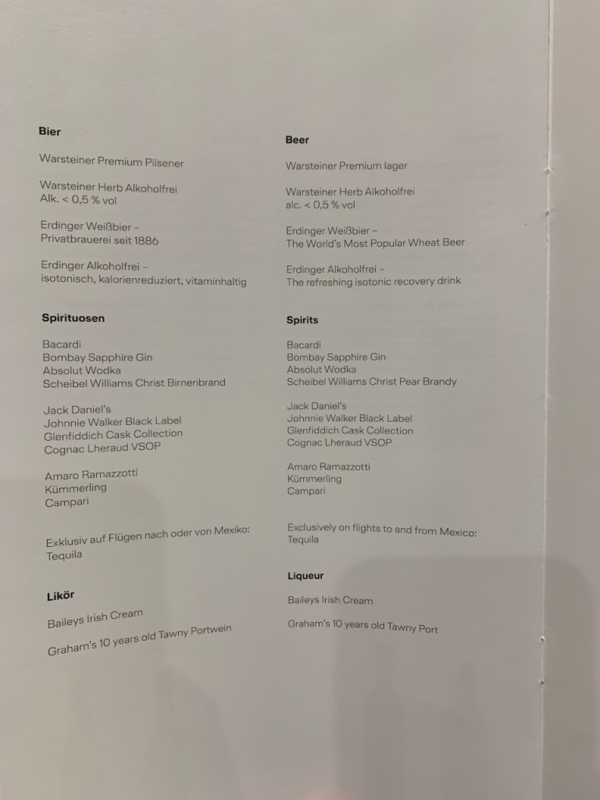 There were some reasonable food and drink options, a couple of showers, which I refreshed myself in and well, that was it. No view to speak of at all, and the wi-fi was average. From there, the gate that Lufthansa use was right at the very end of the pier, so another ten or fifteen minute walk again. Security is conducted at the gate and was quick but seemed fairly cursory. I luckily arrived just as they were calling boarding, and so was among the first on board, what was a totally full flight, with every seat taken. 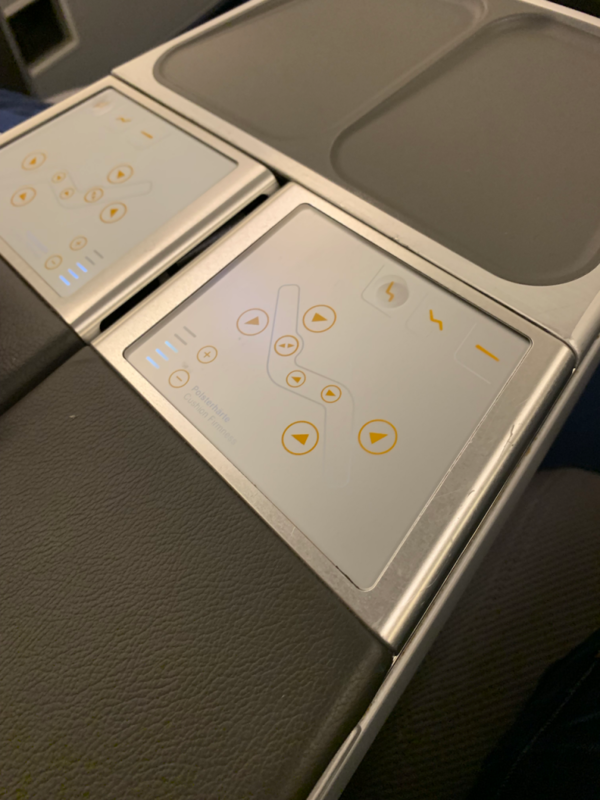 Lufthansa have configured the A380 in a 2-2-2 configuration – that means if you’re in a window seat, you will have to step over your seat mate’s feet. 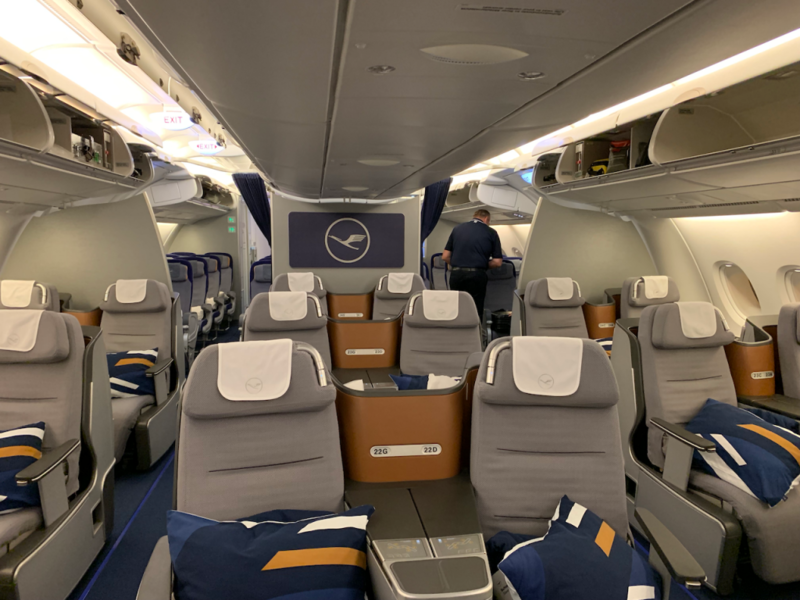 They’ve configured it in two cabins – a larger one behind the first set of doors, and a second mini-cabin of four rows. I was in the second cabin, in the bulkhead seat. Finally, behind business are a few rows of regular economy (Premium Economy is downstairs). The biggest drawback of the seat is that there is no privacy. At all. 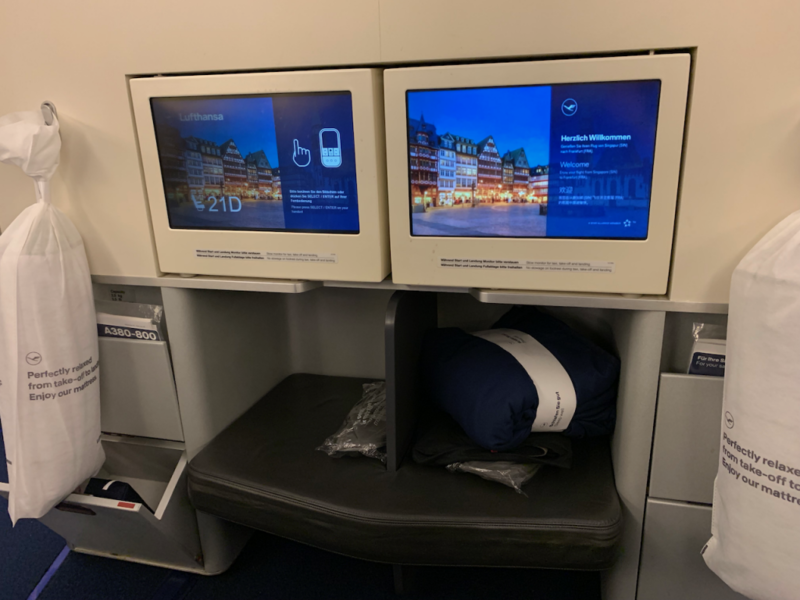 For those used to a British Airways Club World window seat where you can shut yourself off from the world, this is the total opposite. That said, I do find it very comfortable. Waiting at my seat was a pillow and a quilt. In addition, as this was a longer flight, there was also a mattress pad. The seat controls were in the centre console and were pretty easy to use. 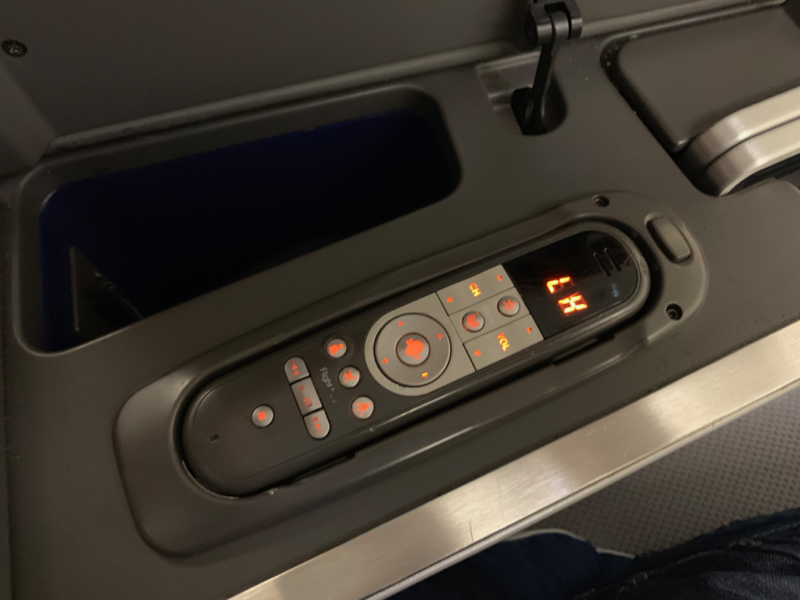 Lifting it up revealed the in-flight entertainment controls, plus the built-in Bose noise-cancelling headphones. Which, being Bose are excellent. 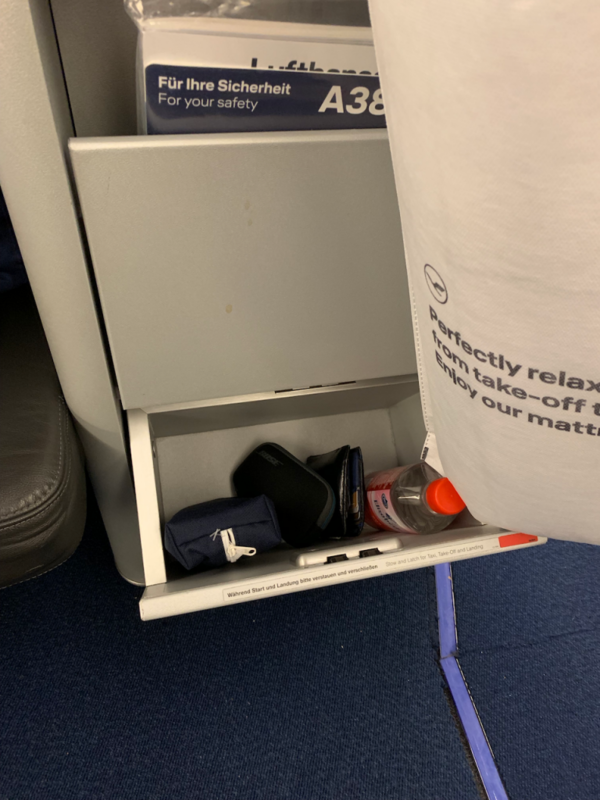 Also at my seat was a literature storage pocket, plus another little drawer underneath it for bits and bobs. It also contained a bottle of water and the amenity kit. The IFE screen was fixed in front and was of a reasonable size, but not as good as the Singapore Airlines system. However there was Wi-Fi available on the aircraft. However as you can see from the photo above – your feet are very close to your neighbour’s. In my particular case, I got lucky in that I was sat next to a cute, twinky 20-something that had got lucky and upgraded from economy. No complaints from me. The crew were very chirpy and were warmly welcoming people on board. 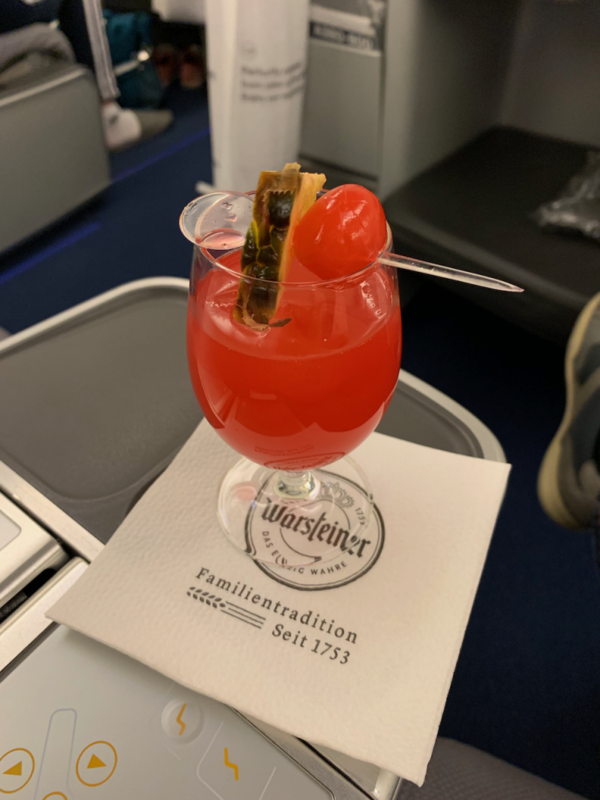 In addition to the normal pre-departure drink of water, orange juice and sparkling wine, they were also offering a Singapore Sling. I felt it would be rude to say no and one was brought straight over. Being Lufthansa, we pushed back on time and took the skies. 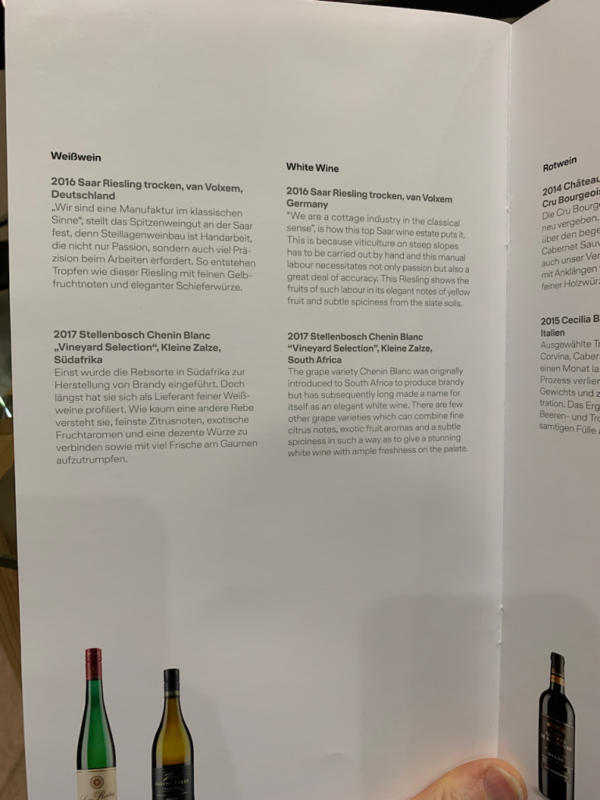 The menu looked quite good. 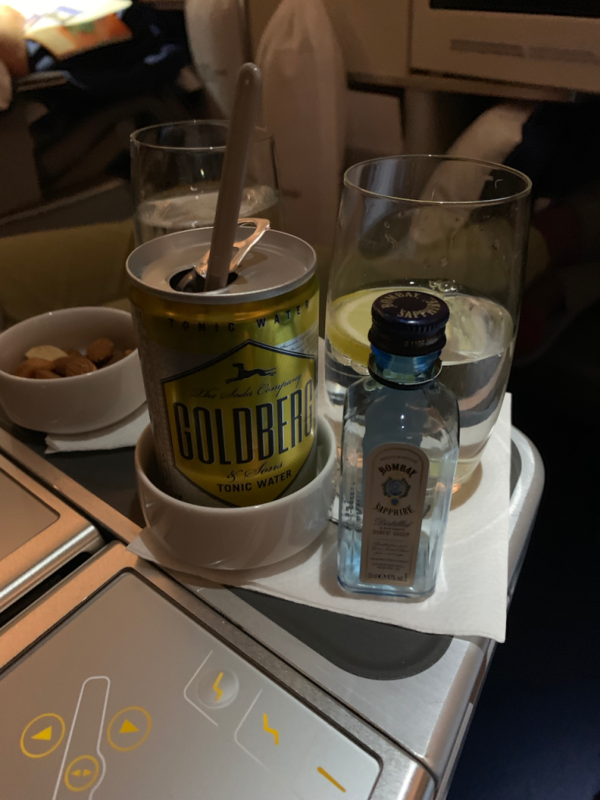 As if by magic, my gin and tonic arrived, with a bowl of mixed nuts. 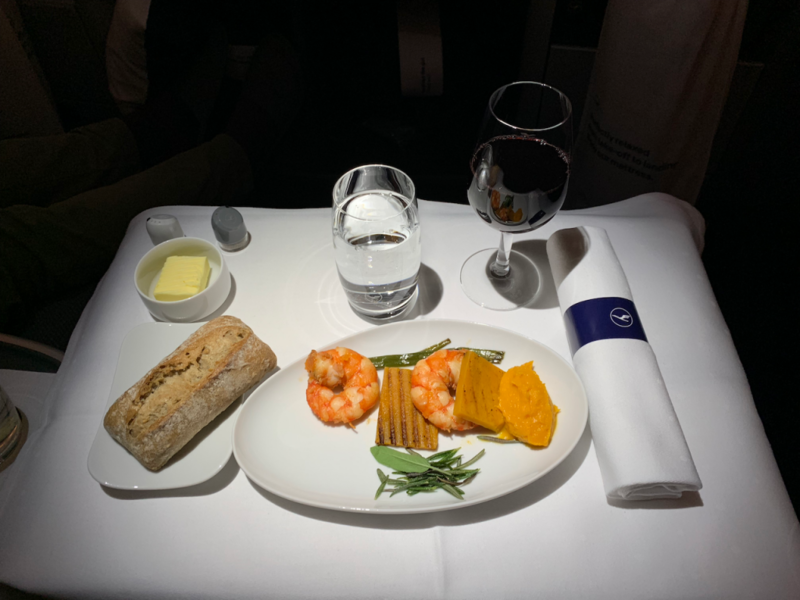 The crew laid out the table with a linen table cloth and brought out the starter – I’d opted for the King Prawn. For the main course I went for the veal, which turned out to be excellent – very tender and nicely cooked. 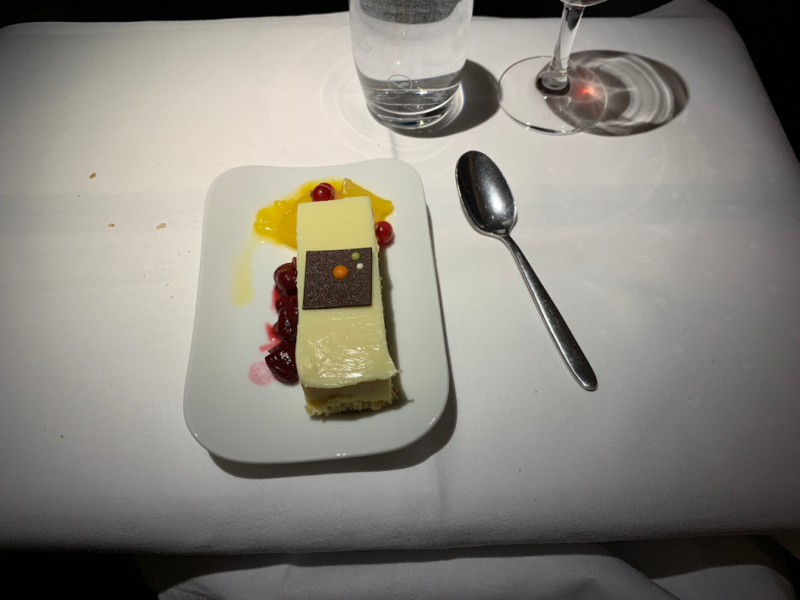 The crew were able to tempt me with the chocolate cheesecake as well. With that, I was pretty tired so put the seat into bed mode, laid out the mattress pad and got some sleep. 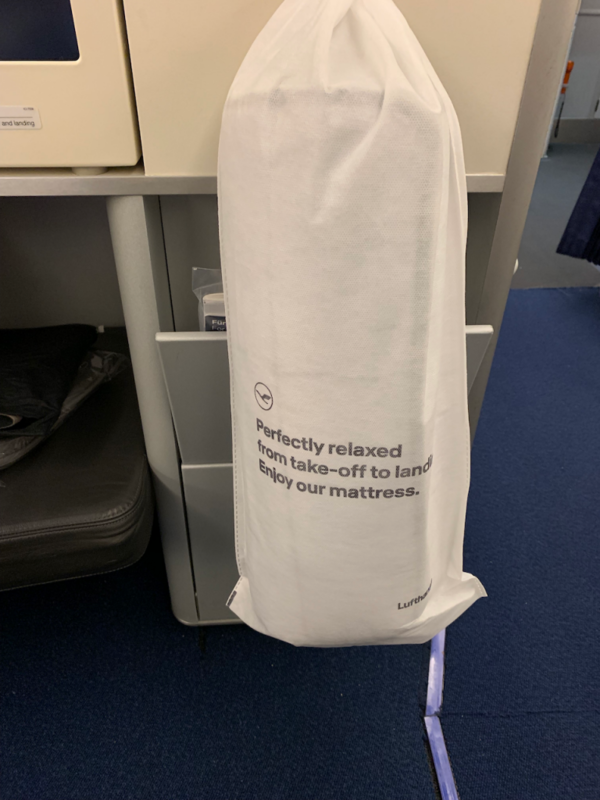 I had already brought some pyjamas with me from a previous flight, however they were handing out sleep “sweaters” to all passengers that wanted them; essentially a pyjama top. I slept pretty well actually – must have been a good seven or eight hours before I woke up with perhaps a couple of hours to go. 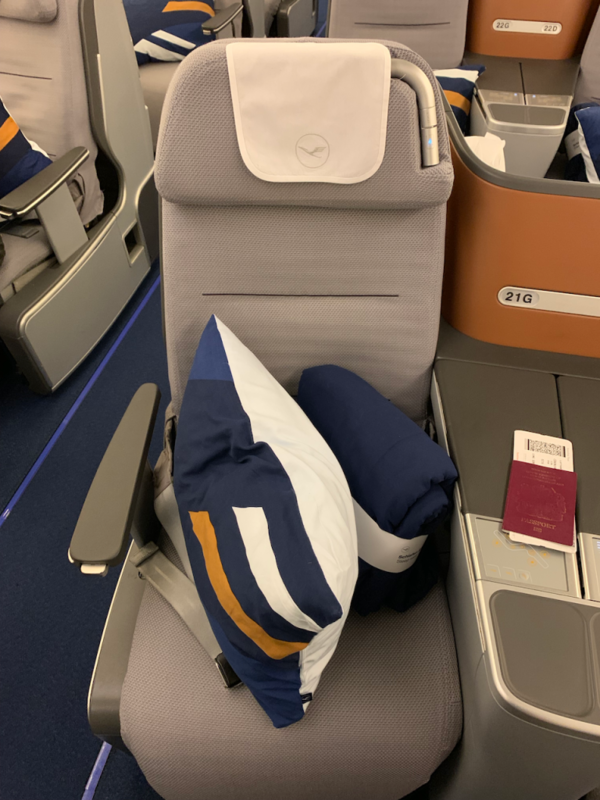 The seat is very good for sleeping, with my only criticism being that it’s perhaps a little narrow. After I work, I popped into the galley and the crew very kindly made me a double espresso. About thirty minutes later, the main breakfast service started and I went for the omelette with sausage. Breakfast isn’t usually that good, but again I was actually quite impressed with the food. The crew brought another double espresso as well. 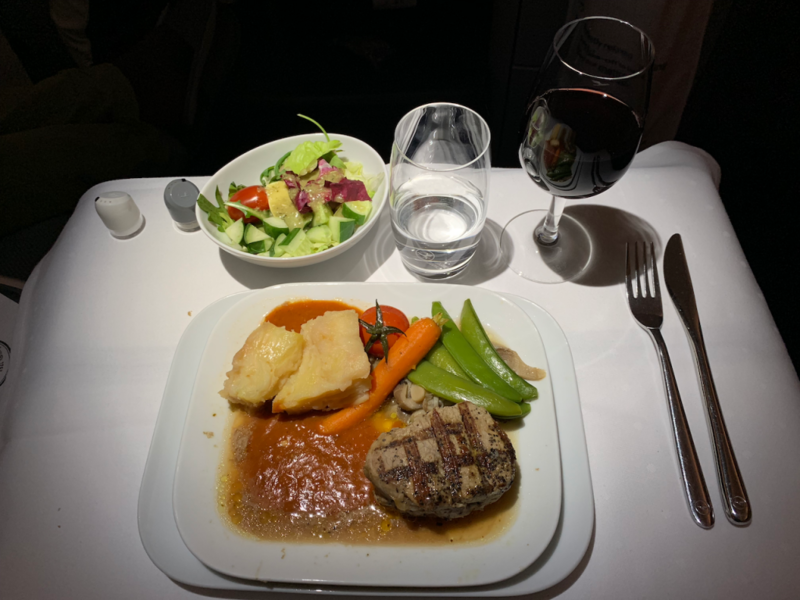 The food was cleared away and we arrived into Frankfurt two minutes early. 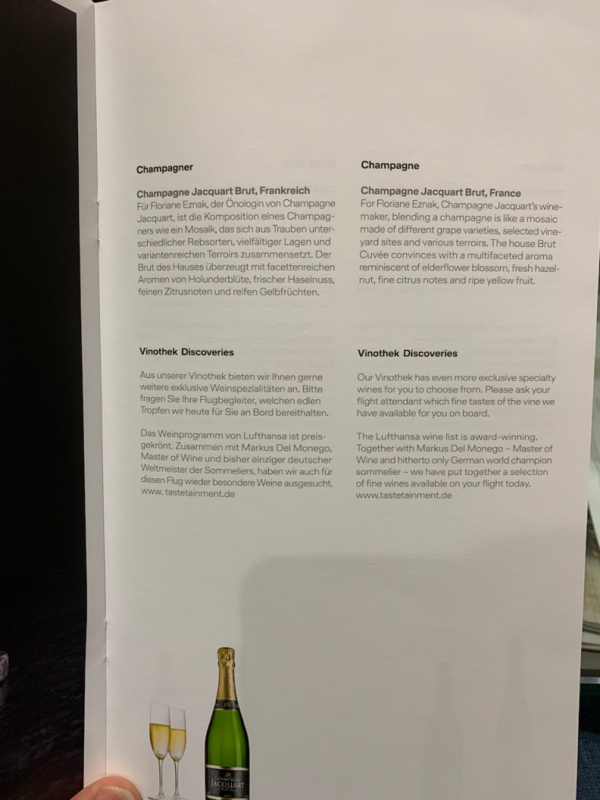 Disembarking, I noticed that we arrived into the secure area of the terminal – evidently Frankfurt “trusted” the security at Changi sufficiently to allow us not to go through further screening. That meant it was only a passport check to enter the Schengen area, from the ‘Z’ gates that we’d arrived into. This made the connection experience significantly less hassle than I’d previously experienced. 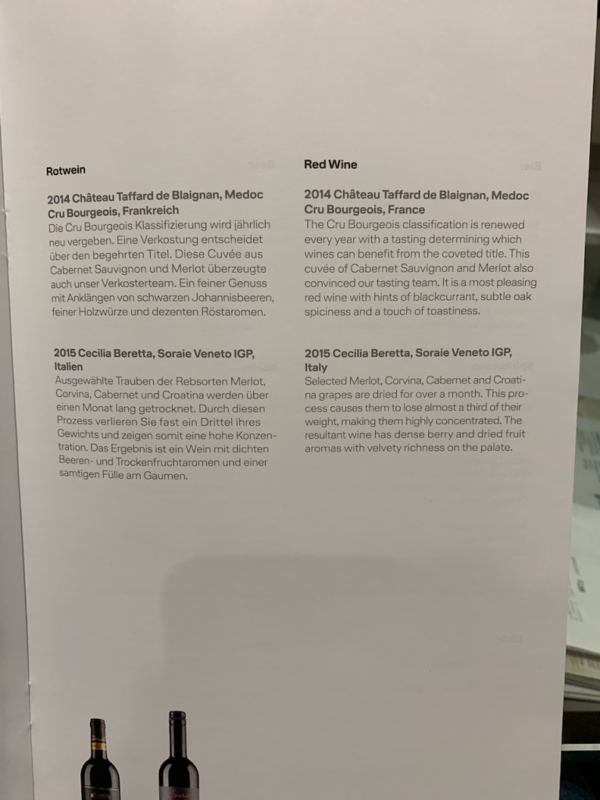 It was a pretty decent flight. The food was good, the crew were chirpy, smiley and friendly, and I managed to get a decent amount of meaningful rest. The seat is flawed in different ways to the Club World seat, but I think perhaps less badly (but that’s highly subjective). It’s only six across as opposed to seven across with Club World, and there are fewer seats where you don’t have access to the aisle. However, there’s less privacy. Internet access is available across their entire fleet. Overall, it was a pretty solid 7.5/10 and I’m looking forwards to stepping on board again. 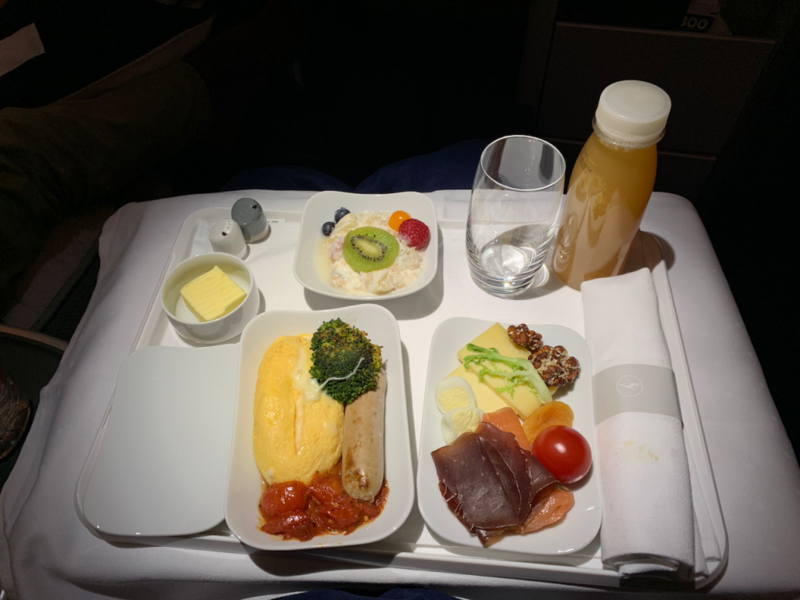 Previous Post: Singapore Airlines Business Class. Melbourne to Singapore. Next Post: Tech review. Bose noise-masking sleepbuds.